There are two ways to join a conference call from a mobile without having to type in your PIN code. 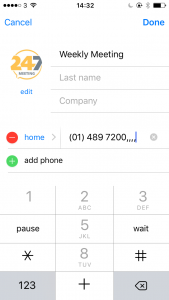 The first and most reliable method is to use 247meeting Mobile. You can read more about our app here. 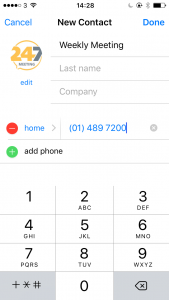 1: Create a contact in your phone, as normal. 2: Type in the Dial In number from 247meeting.com/numbers that you would like to use. 3: Here you will need to enter a pause, as part of the same number. 4: On your keyboard, find the * button which once long pressed should enter a comma, which is a pause or will say ‘Pause’. How many pauses you should include will depend on your phone so you may need to test the pause yourself before joining a conference. 5: Finally, at the end of the number type in your PIN code, followed by the # key. 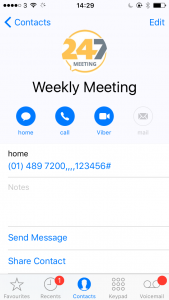 6: Save your contact and you will be able to join a conference by calling your contact, without having to enter the PIN code.